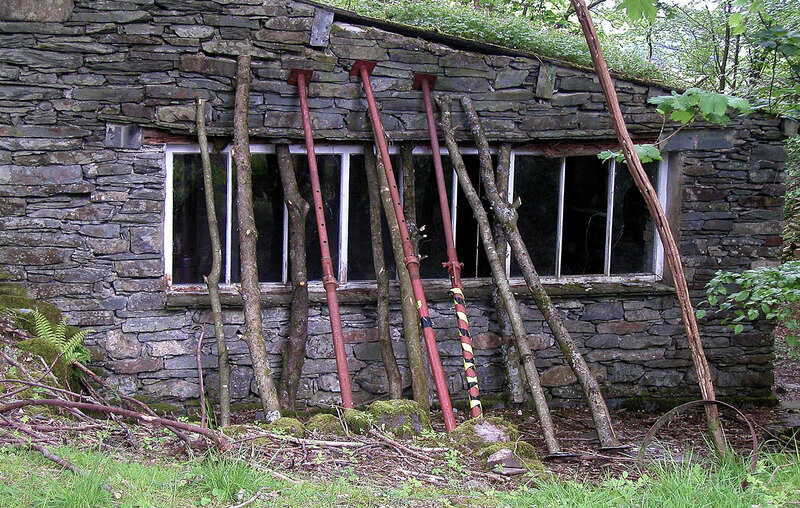 Development of the Merz Barn site took on a new lease of life in 2010 when the replacement wall of the Merz Barn with its crumbling cross-beam and shattered picture windows was taken down, and a replacement built by a Langdale craftsman, Mike Hodgson. It took another three years before the money was found to remove the cracked and leaking corrugated perspex roof and replace it with the corrugated steel that had been there when Schwitters first saw the barn, together with a replica of the skylight he had persuaded Harry Pierce to install in the far corner, from where it had channelled light down upon the artwork. And of course the Barn was still running with water every time it rained, a not unfrequent occurrence in Langdale. That too would be remedied in 2013, when the slope behind the Barn was excavated for adequate drainage to be installed. Scultural model of Jack’s Cottage by artist Jill Randall, 2014. It was at this time too that Ivy Cottage was comprehensively renovated. Hot and cold running water and electricity were installed along with a telephone and wi-fi, and Harry Pierce’s old bath moved over from the shippon lean-to, and a wood-burning stove and a calor gas cooker added. The roof however was still only tar-paper, and leaks appeared with ever-increasing frequency. Jill Randall’s little model of the cottage features the array of planks and stones placed on the roof to keep it from taking off in the gales. By the time she had completed the work however the roof had been replaced with a more durable covering. But even in 2010 the premises were otherwise snug, and far better than a tent on every count. It was agreed to rename the cottage after Jack Cook, Harry Pierce’s assistant gardener, who had gone on living there long after Harry had died. From ‘Kurt Schwitters in England’, award winning graphic novel by Lars Fiske. © Lars Fiske. MERZTEXTE Seminar and Exhibition, June 11-13, 2010, with Norwegian cartoonists Lars Fiske & Steffen Kverneland. the seminar was arranged at short notice after the Norwegian duo had asked if they could visit Cylinders to gather material for the English version of their Kurt Merz Schwitters graphic novel. The volumes on Schwitters’ life in Germany and Norway had already been published, and the series went on to win a major award in Norway after the English portion had been completed. The page showing Ian Hunter’s tour of the Merz Barn is a miracle of compressed information. ‘MerzNerd’ indeed! Flyer for ‘Merz in Schottland’. Taking the concept of Merz up to Scotland was a rather wacky idea, and would not have worked without the enthusiastic collaboration of the near legendary arts impresario Richard Demarco. 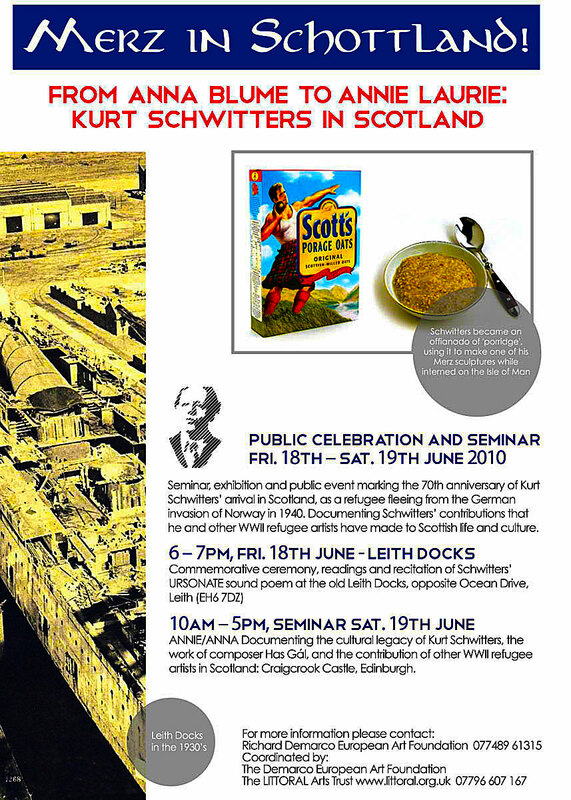 Schwitters had left Norway a month after the Germans invaded his new place of refuge, landing at the port of Leith on June 18th 1940, so there was a 50 year anniversary to be celebrated. A small but select group of people gathered at a disused dock in Leith, surrounded by blocks of luxury apartment blocks, to greet a rowing boat piloted by members of Port Seton’s ‘Boatie Blest’ group of volunteers. Florian Kaplick was piped ashore by Scotland’s only lady Piper, glamorous in her swirling kilt. He then regaled the assembly (and a few startled inhabitants of the surrounding flats) with a section of Schwitters’ Ursonate blasted through a megaphone. A libation of genuine champagne was then enjoyed by all. This was followed by a second rendition of the Ursonate delivered from the Boatie Blest rowing boat, this time at Port Seton, by Ian Hunter, Florian having declined to embark in the boat a second time. After that a very jolly evening was enjoyed by all. Schwitters in Scotland’, a well atrtended seminar, took place at Craigmillar Castle, Edinburgh the next day. This was organised in collaboration with The Demarco Foundation, the theme being emigration, and Richard Demarco gave a moving account of his own family’s experience of arriving in Edinburgh as incomers before WWII. Artist Jill Rock with drawing of the Willow Root. Jill with the Root of Modernism. Artist Jill Rock, a great friend of the Elterwater Merz Barn project noticed, on one of her frequent visitors to Cylinders the upturned root of an ancient willow tree that had been grubbed up out of the cleared area behind the shippon and left to mature whilst Ian thought of a use for it. Jill took a liking for the root, sketched it, considered it, and then spent many days, spread over several years, expertly freeing the structure from its surrounding mud. The sculpture, which she titled ‘The Root of Modernism’ was moved to the space beside the Merz Barn, later re-fashioned as the Merz Platz, where it will stand until it has crumbled into earth. From the first days at Cylinders Littoral began to forge links with the primary schools in South Cumbria, chief of which was of course Langdale Primary School, whose then Head Teacher Mark Squires proved an enthusiastic champion of the project. Environmental workshop: children from Langdale Primary School with Ian Hunter, 2007. Early projects with the Langdale children focused on making and exhibiting Snake Sticks, creating spin paintings, and decorating the Cylinders site in various ways, most of which left swathes of glitter, sequins, scraps of fabric, and pools of paint in their wake. As much as possible is later laboriously harvested and stored for future occasions, but some no doubt drifts into the subsoil and adorns the burrows of rabbits, moles and mice. A series of Spin Painting workshops followed the exhibition of Damien Hirst’s work at Cylinders..
Children from Langdale School with their spin paintings. The Spin Painting overalls exhibited along the Merz Weg as an art installation in its own right. On June 24th, 2010 20 pupils from Manchester’s Cheetham Community Primary School at Cylinders , together with Langdale Primary School. Music and singing workshop with Martin Bagness, and Mike Willoughby. Mike’s recording of the song, together with many images of art and music workshops with Langdale School at Cylinders, can be found on the ‘Archive’ page of this website. A video of children from Montreal School Cleator Moor, shot at Cylinders in 2011 was made by Alex Rob as part of a collection of interviews and footage of creative practitioners at work in Cumbrian schools. Alex Rob on Vimeo | artistsatwork.org With the permission of Creative Futures Cumbria. 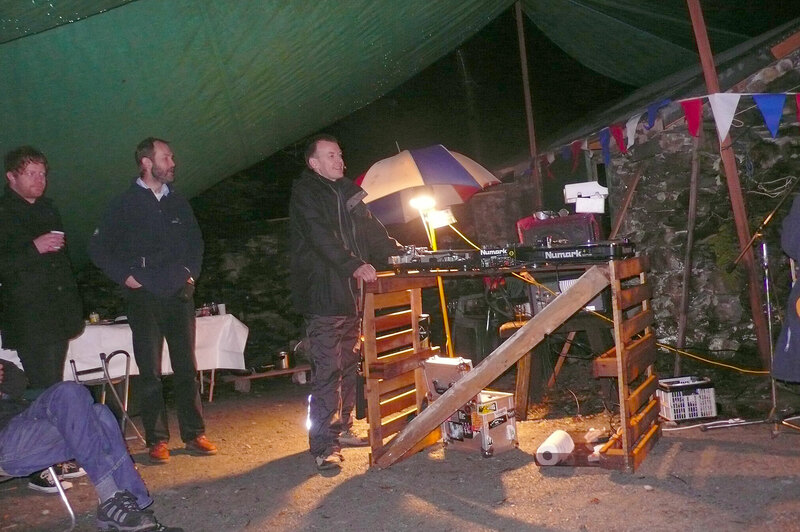 The main public event in 2010 was the KS10 Autumn School,Re-constructions: the Merz Barn and Schwitters’ contemporary art legacy, 01-3.10.10, which was preceded by a luncheon on October 1st. This was held in a big marquee on what by this time had become a lawn, albeit kept mown by the army of rabbits that had built up, encouraged by the wildlife-tolerant attitude prevailing at Cylinders. An array of VIPs from Arts Council North West, and the County, District and Parish Councils, as well as artists, students, and local people attended the event. Howard Hull, Director of Brantwood, meets Jim Tough, CEO Arts Council North West, at Cylinders, 1.10.10. 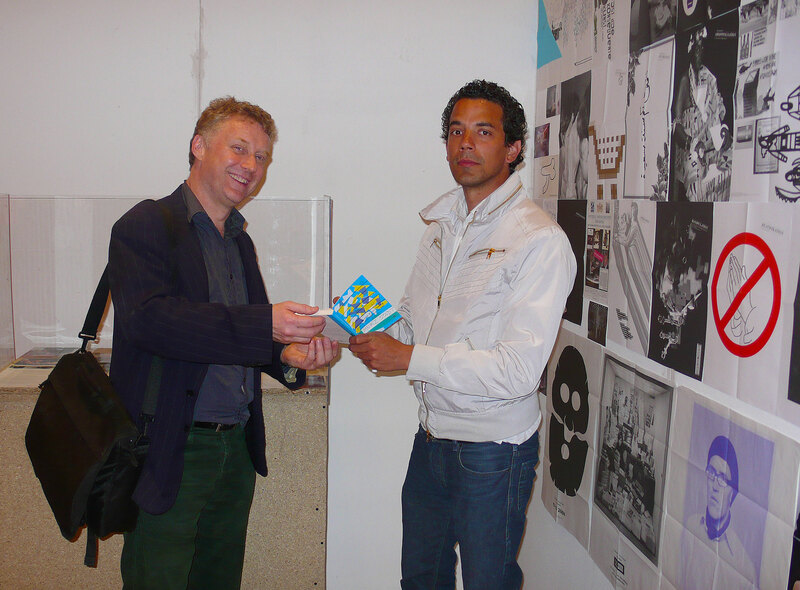 Adrian Glew, Tate Archivist, meets Adrian Notz of the Café Voltaire, Zurich. There were three separate exhibitions, including a show devoted to the collage works of Welsh artist Islwyn Watkins: Reassembling Past Today, in the Shippon Gallery. The keynote speaker was Dr John Elderfield, the former Chief Curator of Painting and Sculpture at the Museum of Modern Art, New York. His talk was titled Bewilderment at the Merz Barn, which went down well with the large audience in Chapel Stile Village Hall. John Elderfield being filmed for ‘Look North Tonight’ in the Merz Barn, 1.10.10. ‘One thing I would like to say before we look at this is to thank Littoral for what it is doing. I think it is so extraordinary. For those of us who have loved what Schwitters has done here it has been a source of difficulty to see how little had happened before Ian and Celia arrived on the scene a decade ago, with a determination no less than equal to the artist’s. They have really carried this along, until now we have this great organisation. This is a hinge moment. A great deal has been achieved and we are right at the turning point. Anything we can do to put some oil on the hinges we must and should do’. John Elderfield, ‘Bewilderment in the Merz Barn’, Oct. 1st 2010‘. Artist Islwyn Watkins dancing at the KS10 Merz Kabaret. Florian Kaplick reading the ‘Ursonate’. The next day was devoted to seminars, and in the evening there was a cabaret which included: PASIFIKA – Samoan/Maori Polynesian music and dance group, the Lakeland Fiddlers, and Cumbrian folk musicians, the Amble Singers ladies choir, and musician/ composer Florian Kaplick presenting Schwitters’ Ursonate sound piece. British Sea Power visit Cylinders: lunch in the Shippon, November 2nd 2010. The Westmorland Gazette announces that a life size replica of the Merz Barn is to be built by Langdale craftsmen in the heart of Piccadilly. Towards the end of 2010 Littoral learnt with some surprise that the Curator of the following year’s Modern British Sculpture’ Exhibition at the Royal Academy, Dr. Penelope Curtis, had resolved to include, not in the show itself but in the courtyard outside the Academy building, a full-scale replica of the Merz Barn building, as a tribute to Schwitters’ important-but-not-quite-British status in the annals of art history. 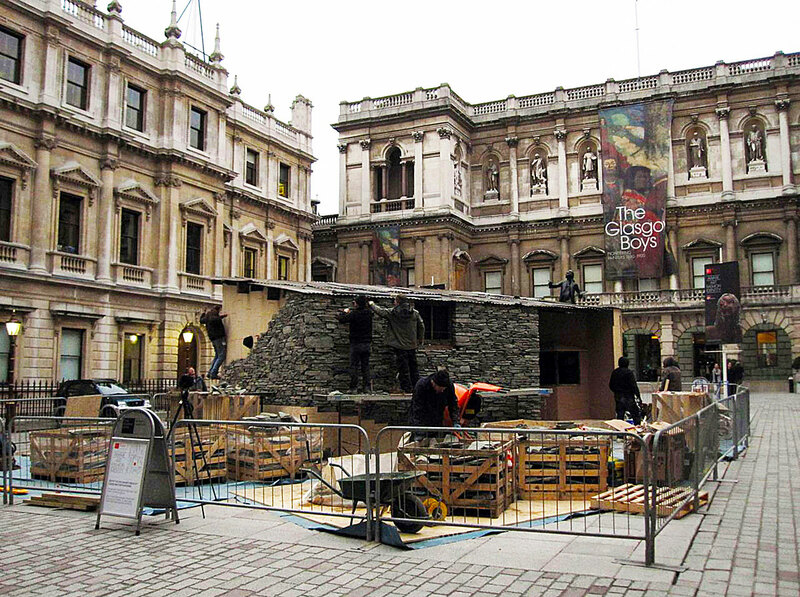 The completed replica of the Merz Barn in the Royal Academy forecourt, Piccadilly, January 2011. Delighted by the unexpected boost to visibility that this would bring, Littoral suggested that the replica should be built of genuine Langdale stone by genuine Langdale stone wallers, and this was accepted without argument. At a stroke we were able to give a boost to the Langdale Merz Barn project, and to the local economy. The selected craftsmen, who included our stalwart farmer contractor Mike Edmondson, were pleased at the idea of going to London to show off their skills. Rob Fraser agreed to perform the dual function of project managing the team at the same time as providing photographic documentation, and Celtic Storm made a film about Schwitters that included the building process. Poster for the MerzKabaret at Islington Mill Studios. ‘Nasci’ Exhibition at Castlefield Gallery. 2011 marked the 5th year of the ownership of the Merz Barn project by the Littoral Trust. Nationally the project was becoming well known, but artists in Manchester were still scarcely aware of the asset that lay on their doorstep. Something had to be done, and so the MerzMan project came into being. 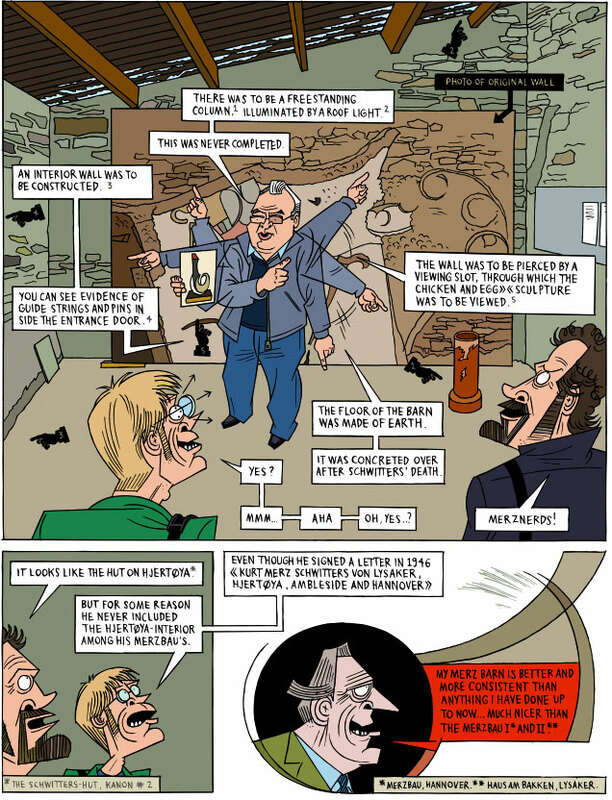 MadLab: hosted an exhibition of Lars Fiske’s graphic novel: ‘Kurt Merz Schwitters’. Seminar in the MadLab premises. The purpose was threefold: i) to give audiences and artists in Manchester an opportunity to learn about the contribution made by the refugee artist Kurt Schwitters to the artistic culture of the North West; ii) to introduce artists in Greater Manchester to Cylinders, and to invite them to visit the Merz Barn and consider applying to take up residencies there; and iii) to offer commissions and exhibition opportunities to artists in Manchester during February to April/May 2011. 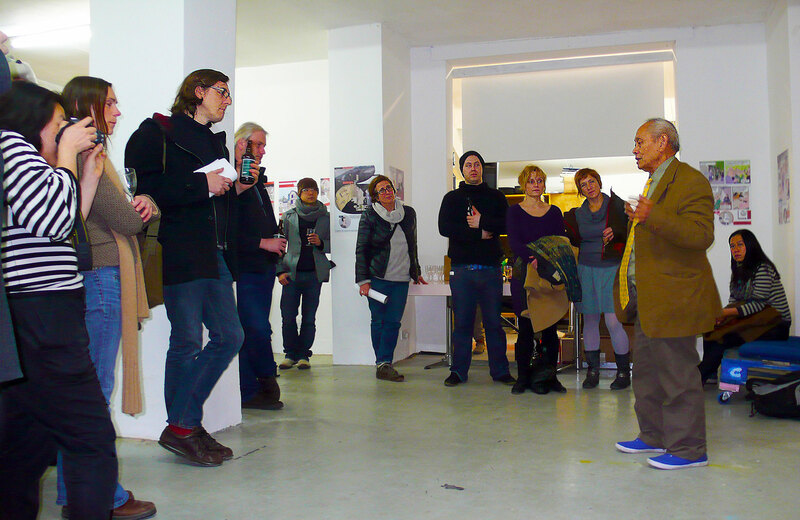 Artist David Medalla: Seminar in the MadLab studios. 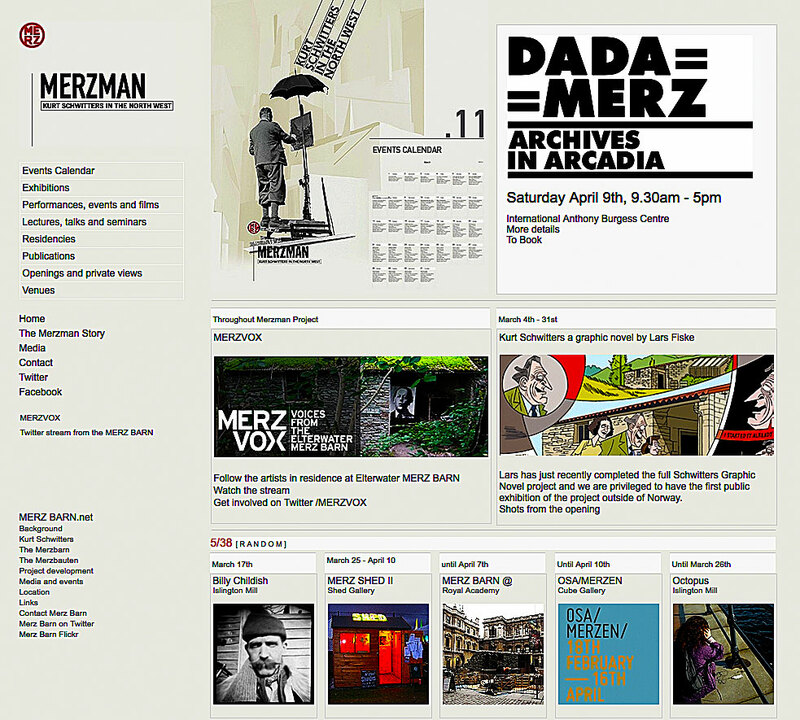 A subsidiary objective was to encourage visual arts venues and practitioners in the city to work together more closely, and to enjoy the benefits of shared publicity through advertisements and the custom-built website <merzman.co.uk> and the associated Facebook and Twitter projects. Billy Childish flm showing and performance in Islington Mill. The project succeeded in meeting all these aims. There were well publicised exhibitions at CUBE Gallery (OSA/MERZEN), Castlefield (Born After 1924), MadLab (Kurt Merz Schwitters), Manchester Metropolitan University’s Pavement Gallery (the DOCU-MERZ digital installation), Bury Art Gallery (the Studio Schwitters Audio Art installation). Islington Mill Studios, the Anthony Burgess Foundation Centre, MadLab, the Mechanics Institute, the Royal Northern College of Music, and the Irish World Heritage Centre. Other venues hosted a variety of seminars, lectures, performances, film showings and artist residencies. During the period of the Festival the following artists and groups visited the Merz Barn in Cumbria, staying in the Weirside bunk barn: William Titley and 20 students from UCLan (MerzVox digital project); OSA (Office of Subversive Architecture) and 18 architectural students from Paris; artists Julike Gittner; Ergo Phizmiz; David Medalla; Adam Nankervis; Octopus; Pool Disability Arts (MerzShed) Yu-Chen Wang and Andro Semeiko. The site and its future use by artists were discussed at the MERZMAN Conference in the Mechanics Institute. Jaap Blonk performing the ‘Ursonate’ in Warth Mill. 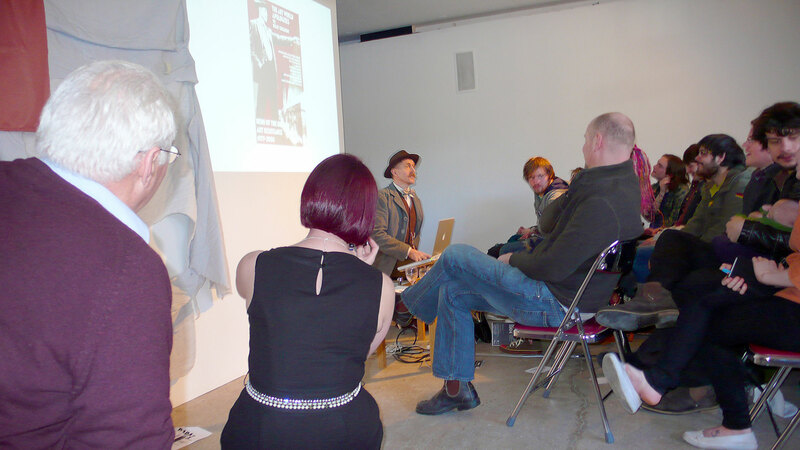 On May 1st 2011 a final MerzMan event took place, this time in conjunction with Bury Art Gallery’s Text Festival. As it happens Kurt Schwitters, after first arriving in Britain, was held for a few days in detention in Bury, in an old industrial mill. The building, Warth Mill, is now derelict but the basement was usable, just. On the afternoon of May 1st four exponents of Schwitters’ Ursonate met there: Jaap Blonk, Florian Kaplik, Christopher Fox, and, a late addition poached from the Text Festival, the experimental Canadian poet Christian Bök, who promised to provide the quickest rendition of the Ursonate ever. The lighting failed shortly before the performances were due to commence which lent an eerie atmosphere to the occasion for the 20 or so people who had gathered to hear the work. 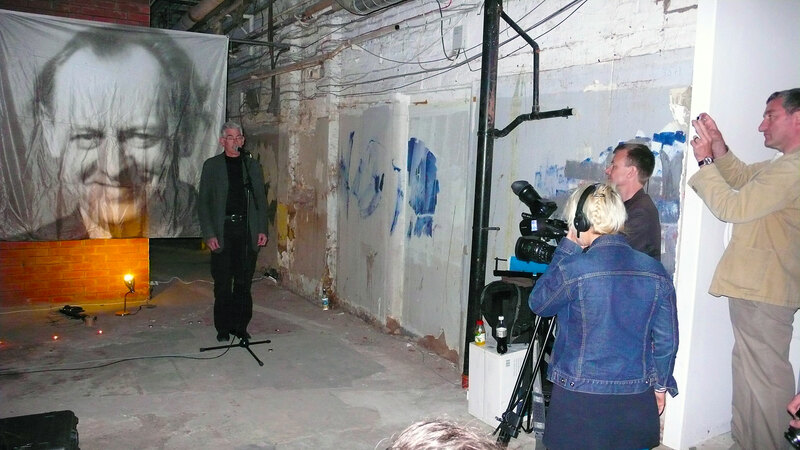 Performance of Schwitters’ ‘Ursonate’ in Warth Mill, Bury. 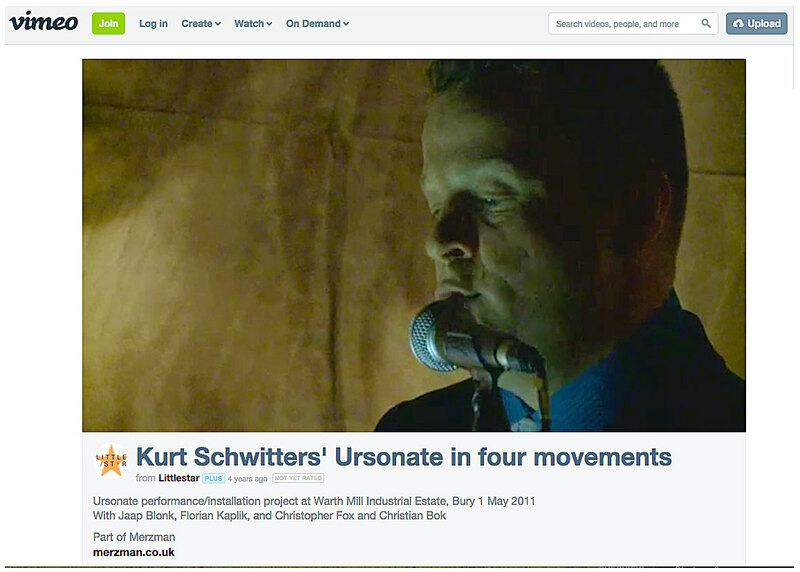 The proceedings filmed by LittleStar, and can be experienced on < http://vimeo.com/23275942 >. The 2011 Summer School was unusually ambitious, and in later years tended to be cut down to 10 days or a week. This was the last year that Littoral enjoyed proper funding for the Merz Barn project, and we made the most of it, offering a Creative Skills Week with Artist Heath Bunting; Seminars with Graham Martin (text artist), Dave Mee and Hwa Jung Young (digital artists), John Barwise (artist), Rob Fraser (photographer), and Ian Hunter (artist). 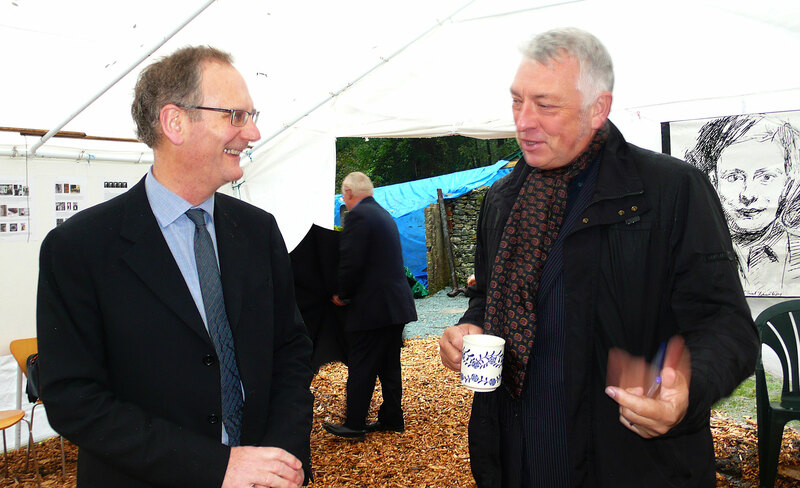 There were craft seminars with Walter Lloyd, Brian Crawley, Tom Branton, and others; and children’s art workshops on site with Langdale Primary School. 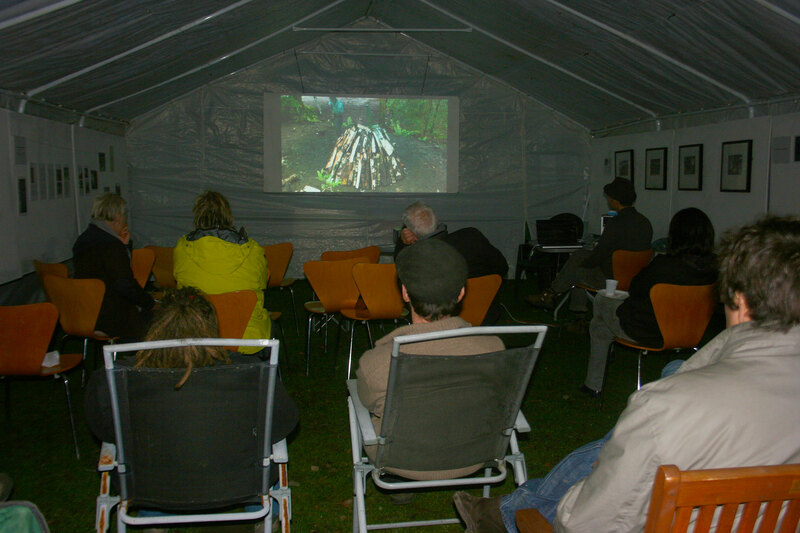 Slade student Will Saunders made an impressive video film of the two day charcoal burn led by Brian Crawley, and this was shown in the marquee at a later occasion. A sunny Summer School at Cylinders. Photo: Graham Martin. In the marquee, October 2011. 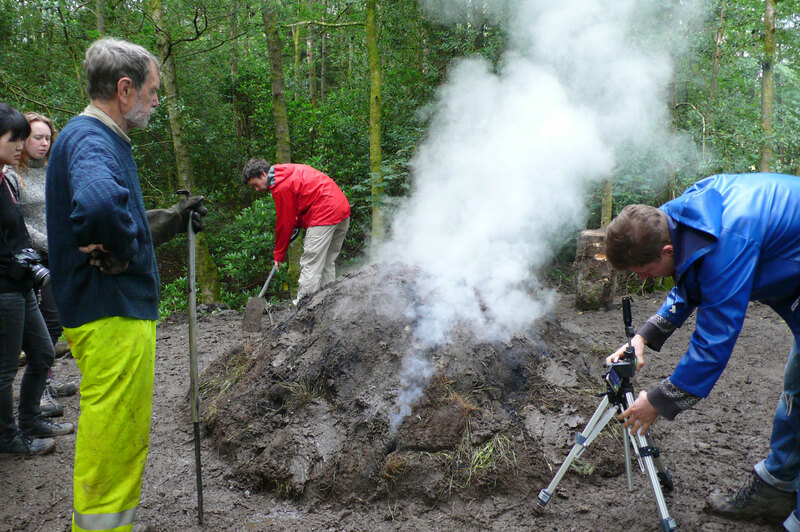 Viewing Will Saunders’ video of the 2011 Summer School Charcoal Burn. MERZONIC Weekend with White Label, September 17th, 2011.